Part 122: Herod. What can be said about Herod the Great? Like any human being, Herod’s life weaved in between good and evil. There were many that he did that put Judaea on the map, not just in his time period, but throughout time. Some of those feats were amazing; however, Herod, like many rulers before and after him, was utterly corrupted by power and he let nothing stand in the way of his ambition. 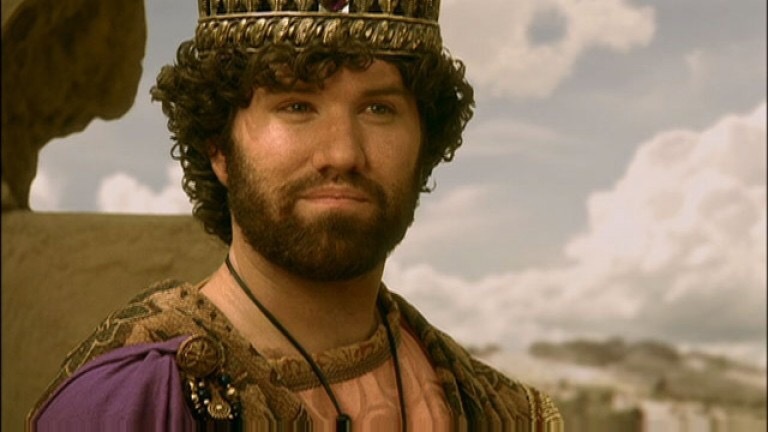 To be balanced, let’s quickly look at some of the “amazing” feats of King Herod. First, he was born in about 74 or 73 CE in Idumea, which is also known as Edom and lies due south of Judaea and Moab (where Ruth was from). Traditionally, the Edomites were NOT Jewish and worshipped gods such as Quas, El, Baal, and Asherah; however, post-Exilic Edom did convert to Judaism and so Herod was raised up as a Jew. Herod became known as “the Great” not because he was a great guy, but because he had spent his reign undergoing major building campaigns, many of which can be seen (in part or in whole) today. He built fortresses such as Masada and Herodium, developed water supplies for Jerusalem, established new cities such as Caesarea Martima, and erected tombs and monuments such as the Cave of the Patriarchs. He and Cleopatra had a stronghold over asphalt mining in the dead sea. That was used for ship building. Furthermore, he leased copper mines from the Romans on Cyprus. With that said, Herod was a despot and a tyrant. He had one of his sons and his wife, along with several other family members, put to death. He had secret police spying on common people to “feel out” whether they were malcontent and a threat to his rule. Protests were prohibited and he had no problem removing people by force. He put any and all who opposed him to death and he taxed the life our of his Jewish subjects so that he could continue to fund his building campaigns. He showed little respect for the laws of Moses and had a Roman Eagle placed in the Temple in honor of Rome. What’s more, this is the same Herod who is reported in the Gospel of Matthew to have ordered the deaths of tons of first-born children up to 2 years old in order to kill any potential messiahs being born in the city of Bethlehem. It is under this despotic king that Jesus was born, and it is this king that sent Mary, Joseph and Jesus fleeing into Egypt as refugees. In the end, Herod’s lavish lifestyle and his tyrannical power came crashing to a hault once he died. He was the last person to be sole king of Judaea. From his death onward, the province was under the rule of three tetrarchs who were overseen by the Roman Procurator or Governor. This reality should remind us that as in power as we might think we are, we are powerless apart from God. Let us be challenged by that and join forces with God as opposed to against God. We are powerless apart from God. Lord, you alone are my rock and redeemer, and I trust in the power of your name. Use me in a way that brings hope, healing, and wholeness in this world. Amen. Part 87: Josiah. Josiah was one of the most important kings. It could be argued that he was was beneath only David and Solomon in importance. This is because Josiah is seen as a reformer, as someone who had the most success in bringing Judah back to a right relationship with God. This reform started when the high priest, Hilkiah, found a scroll while clearing the treasure room of the Temple. This scroll is believed by most scholars to either be a copy of the Deuteronomy or went on to become a part of Deuteronomy, had that book already existed during the time period. Either way, this scroll magically appears in the Temple where no one, evidently, had ever seen it before. It is, when one thinks of it, kind of odd that a sacred scroll was left “hidden” in the treasure room; however, that will be dealt with later. According to the story, Hilkiah brought the scroll to Josiah’s attention. The king sent Hilkiah and other leaders to consult with the prophetess Huldah, who told him that indeed God was going to allow the curses mentioned in the scroll to befall Jerusalem, and all of Judah, as a result of their sins; however, she also assured that this would not take place during King’s reign due to his humility. This word from the prophetess, according to the Chronicler, sparked a fire within Josiah, who had the entire scroll read to the people. He then set into place new rules. There could only ever be one place to worship: the Temple. All foreign idols and shrines were to be destroyed. In fact, Josiah had all areas of worship (outside of the Temple of Jerusalem) destroyed, even if they were to Yahweh. Thus, Josiah centralized worship and mandated that the Jerusalem Temple was the ONLY place that God could be properly worshiped. This had NEVER been the case prior to Josiah. He didn’t just reform Judah either, but he had his troops march up into the Northern Kingdom of Israel and had their places of worship destroyed and their high priests put to death. In fact, he exumed the graves of religious leaders who were already dead and had their bodies burned on the pagan altars. Nice, right? Josiah is seen as one of the greatest kings of Judah’s history. His unwavering zeal for God has been recorded and endured the test of time; however, it must be acknowledged that this opinion of Josiah comes from those who wrote his history. These were people who were in favor of his reforms. Surely, his methods of reform were sometimes questionable and there had to be people who saw him as a power hungry tyrannt who wanted nothing more than to bring all of the tithes and wealth into Jerusalem (through making the Temple the only place one could worship). What’s more, it is certainly “fishy” that a scroll miraculously appears in the Temple where it had never been seen before. It is not impossible that such a find happened; however, it is suspect at the very least, and seems improbable. Many scholars conjecture that Josiah had the scroll created in order to lend Scriptural authority to his reform agenda. If it was God’s will for this to be done, who could then rightfully argue with the king? That begs the question, was it God’s will that all worship be centralized in one place? Was God upset with people worshiping (so long as they were worshiping the one, true God of Israel) up in Samaria (aka Northern Israel)? Was this reform agenda completely God’s will, or was Josiah seeking more power and control. Perhaps it was a combination of those two things? One thing is for sure, Josiah’s descendent, Jesus of Nazareth, pushed back against the centralized worship policy when discussing who he was to a woman at a well in Samaria. Have you ever gotten over zealous in your religious beliefs? Have you ever gone too far in pushing your religious agenda? Have you ever burned others with your attempt to show them the “love” of God? We cannot be sure, one way or the other, as to whether Josiah falls in this category; however, I find it unlikely that God would want dead corpses exumed and burned at the very least. Let us learn from this. Even when God is calling us to bring reform into the world around, that does not mean God wishes for us to overzealously abuse our authority in doing so. Lord, grant us the wisdom to know when we are going to far to carry out our faith. Amen.